Director – Don Michael Paul, Screenplay – Frank De John & David Alton Hedges, Producer – Mike Elliott, Photography – Hein De Vos, Music – Frederik Wiedmann, Visual Effects – Brave New World, Special Effects Supervisor – Paul Pieterse, Prosthetics Design – Clinton Aidan Smith, Production Design – Shane Bunce. Production Company – Universal 1440 Entertainment. The warlord Nebserek finds the tomb of the Egyptian ruler Memtep and takes from it the sword known as the Fang of Anubis. Created by the gods, the sword holds great power because it contains the imprisoned souls of those it has slaughtered. With the power the sword confers, Nebserek goes on to create a vast empire. The only one he has not challenged is the legendary Scorpion King but Mathayus has retired to become a blacksmith in a small village. Nebserek’s lieutenants track Mathayus down him and burn the village to the ground to force him to surrender. On the journey back, a wounded Mathayus is rescued and brought back from near death by the Nubian princess Tala, the daughter of an old friend of Mathayus. She wants him to stand up against Nebserek. Mathayus at first refuses until he realises that this will allow him vengeance against those who slaughtered his village. Doing so requires he and Tala to go on a quest for the mythic Book of Souls, the only means to defeat the Fang of Anubis. The Scorpion King (2002), starring Dwayne Johnson back when he was still billing himself as The Rock, was a modest success. It was a spinoff from The Mummy Returns (2001), where the Scorpion King had originally appeared, and amounted to no more than a lightweight and forgettable sword-and-sorcery adventure. However, it was clearly enough for The Scorpion King to be continued on in several sequels. These consist of The Scorpion King: Rise of a Warrior (2008) starring Michael Copon, and The Scorpion King 3: Battle for Redemption (2012) and The Scorpion King 4: Quest for Power (2015) both starring Victor Webster. This fifth entry in the series has been placed in the hands of Don Michael Paul, an actor who debuted as director of the Steven Seagal film Half Past Dead (2002) and has a made a career out of making mostly action films that are sequels to other people’s films. His films as director include Company of Heroes (2013), Jarhead 2: Field of Fire (2014), Sniper: Legacy (2014), Kindergarten Cop 2 (2016) and Sniper: Ghost Shooter (2016). Paul has regularly dabbled in genre material with the horror film The Garden (2006), Lake Placid: The Final Chapter (2012), Tremors: Bloodlines (2015), Death Race: Beyond Anarchy (2018) and Tremors: A Cold Day in Hell (2018), while he also wrote the Cyberpunk biker film Harley Davidson and the Marlboro Man (1991) and has another whole career as an actor. The Scorpion King films are such a low expectation series that it is hard to drum up enthusiasm for a fifth offering. About all that the films have in common is a bodybuilder hero named Mathayus who is an Akkadian nicknamed The Scorpion King (not that we have ever seen Mathayus reign over a kingdom). This makes the films little more than the equivalent of the Italian peplum of the 1960s that began with Hercules (1958), albeit with better budgets and slightly more fantasy elements, or a less brutal version of Robert E. Howard’s Conan. In almost all cases, the filmmakers cast a barely known fighter and throw them into a series of action scenes set around a minimally sketched-out sword-and-sorcery plot (here the idea of the soul-stealing sword has been appropriated from Stormbringer in Michael Moorcock’s Elric stories). Don Michael Paul is capable of delivering a competent film of this type. His action scenes are passable, even if none of them are memorable afterwards. Zach McGowan makes an okay lead. (Bucking with tradition in all but the second film, McGowan is one of the few people cast in the role of Mathayus who actually comes from an acting background rather than the field of sports/professional fighting). 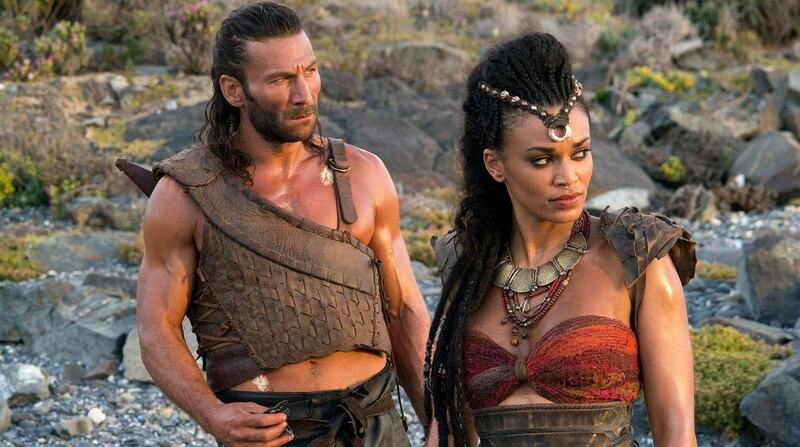 The film is better serviced by Pearl Thusi, and the exotic-looking former model Katy Louise Sanders, neither of whom are given much to do, plus a scene-stealing comedy relief golem. The film passes its time adequately but there feels nothing at stake, nothing that dramatically engages you.